Who doesn’t love chicken satay? I mean it’s a licence to eat peanut butter for dinner. And if there is one thing better than chicken satay, it’s chicken satay pizza. Because, let’s face it. if you’re living your best life. Everything you eat is served on bread with melted cheese. Now, if you’re anything like me, you like to be prepared. 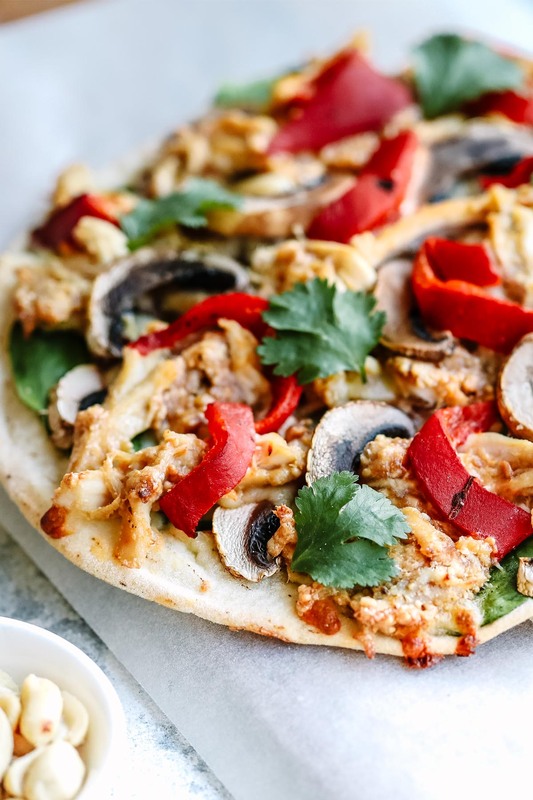 So, here are the things you’re probably going to love most about this chicken satay pizza. A) Think mild creamy peanut sauce, which is beyond easy. I’m talking 3 ingredients-jar-shake-done! B) No actual cooking of chicken needed. Hot supermarket roast chicken. Praise be. C) You could easy make this recipe gluten free by using tamari in the satay sauce and a gluten free wrap for the base. D) Switch up the veggies, or leave them out completely and serve your pizza with a side salad. And, I don’t want to cause an international incident, but you can also add pineapple. Trust me. It’s really good. E) And just in case I lost you with the pineapple. The key ingredients in this recipe are peanut butter and cheese. Okay, I think you’re ready. 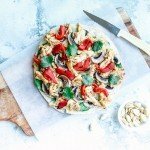 Go eat chicken satay pizza. You will love it. And, don’t forget to let me know what toppings you use, so I can use them to. See what I’m doing there? Basically, using you as an excuse to cook this for the 56th time. Thanks in advance. 2 pita bread or gluten free wraps/pizza bases, depending on your dietary requirements. Place the peanut butter, soy sauce/tamari and coconut in a jar, secure the lid and give it a shake until all the ingredients are combined. Set aside. Shred the chicken and transfer to a bowl. Pour the sauce over the chicken and stir until the chicken is fully coated. Cut the roast capsicum into small pieces. Place 2 pita breads side by side on the lined baking tray. 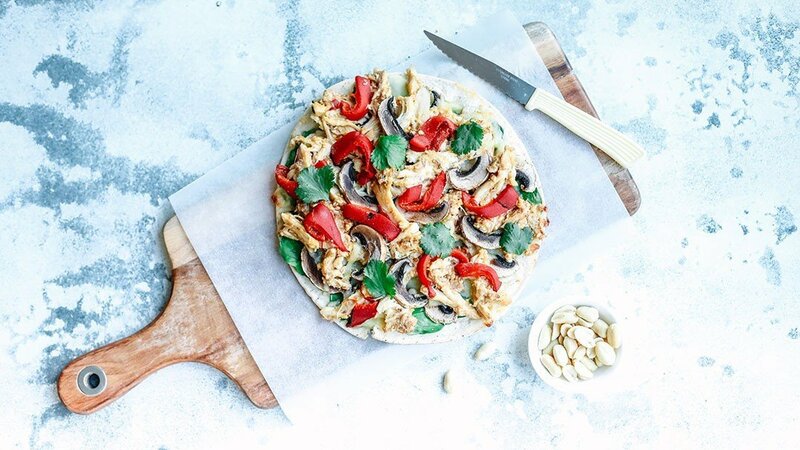 Layer the pita bread with baby spinach, satay chicken, mushrooms and capsicum then sprinkle over the mozzarella. Transfer the baking tray to the oven and cook for 7-10 minutes until the cheese has melted and the ingredients are warmed through. Serve immediately, while the cheese is still melted and delicious. I find that Greek pita makes the best thin and crispy base for homemade pizza. But, you could use Lebanese pita bread or a regular pizza base works really well too. To save time, I buy my mushrooms presliced from the supermarket. If you’d prefer to slice them yourself, just add 5 minutes extra to the cook time. 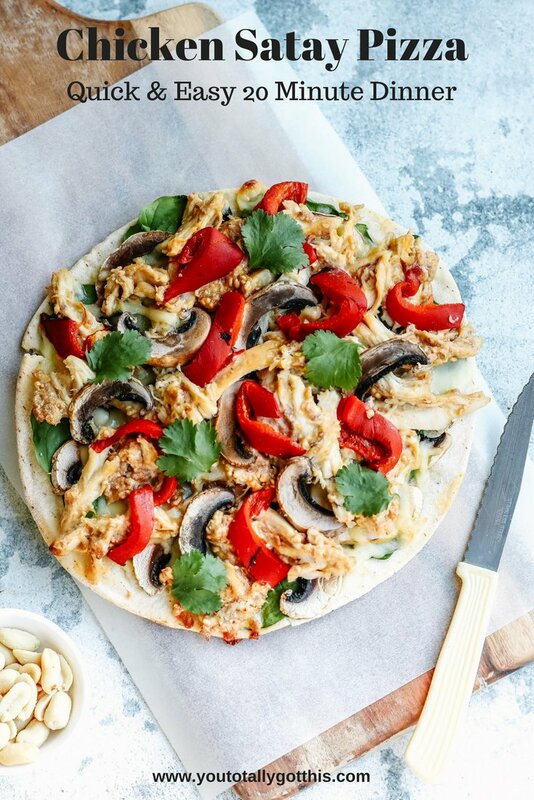 P.S – Want a whole weeks worth of dinners just like this awesome Chicken Satay Pizza Recipe? Grab your FREE quick and easy weeknight dinner plan right here.